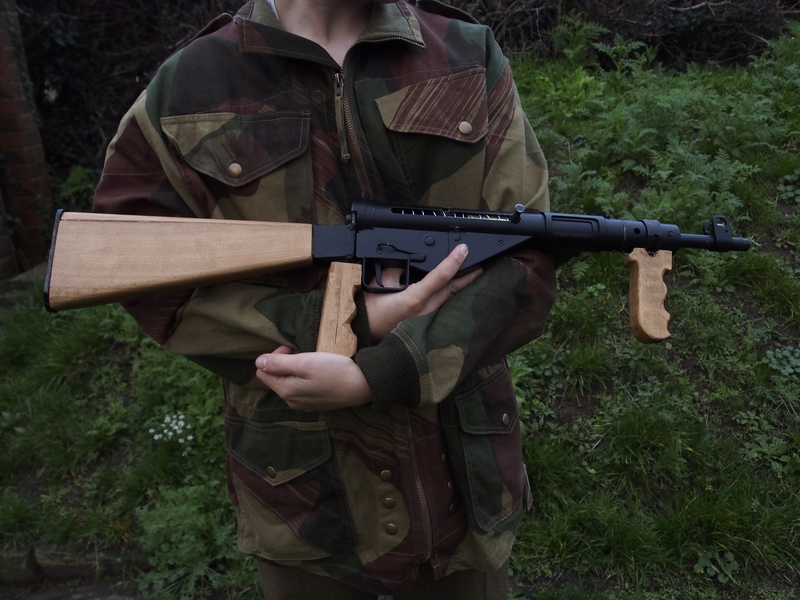 I am pleased to present the Sten MkV conversion kit, designed to be used on the ASG/AGM Sten MKII. Shown in this video is the prototype, the production version will feature some minor variations. 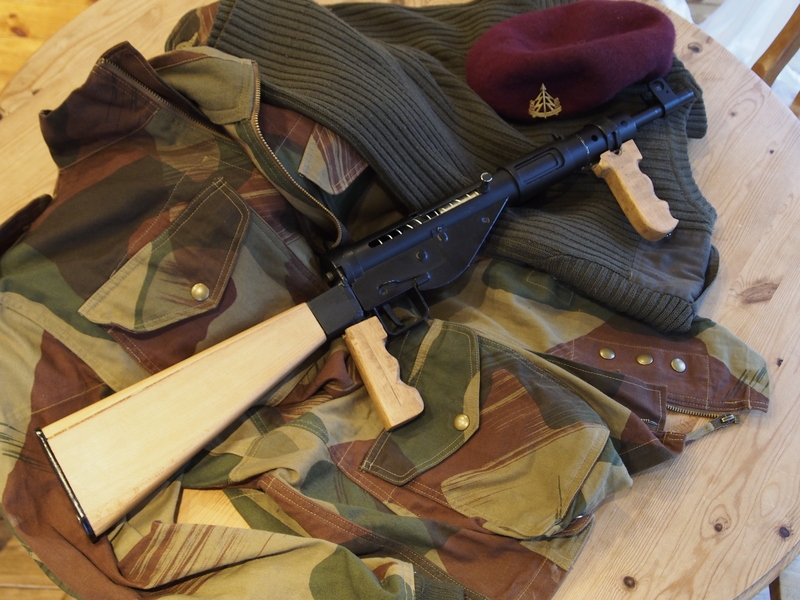 This kit allows the user to have a Sten MkV when it suits them, while allowing for them to swap back to the more widespread MKII for games where this kit would not be suitable (such as certain WWII games). Bearing this in mind, this kit allows for use of the same type of stick batteries used in the T-stocks that come as standard, meaning that there is no need to buy an entirely new battery setup in order to run the LiPos that most purpose-made MkVs require. The battery compartment is also easily accessible from the rear unlike on most airsoft Stens, allowing for a quick and simple battery change in the field. Metal parts of this are steel, except for the fore-grip band, which is copper. Metal finishes are a mixture of black enamel/metal lacquer and oil blacking. This guarantees a finish that closely resembles the standard finish on the rest of the Sten where the surfaces are next to one-another. Oil blacking is used on surfaces that are subject to high tolerances and high levels of contact, such as the buttplate which would otherwise be rubbed shiny in no time at all. Price as of December 2014 is £120. Kits are made to order, so there will be a slight delay between order and dispatch, which you will be advised of upon ordering. If you have any specific requests/alternative finishes please do let us know. All products are Made in England. We are a group of airsofters who have a special interest in more unusual firearms that are not always available or affordable for airsoft. 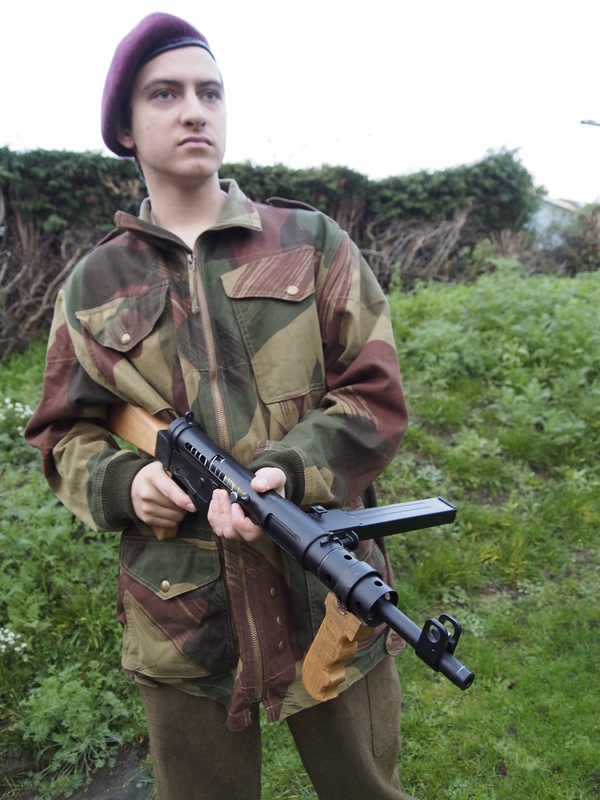 As well as developing kits for airsoft guns already made by other manufacturers, we are looking for opportunities to collaborate with individuals who want something a little bit special. Whether it’s anti-tank or something lightweight we would love to hear from you to help us develop something new. On this blog we will be showing off our newest products, show a little of the process that goes into designing and building them and hopefully some skirmish reviews in the longer run.